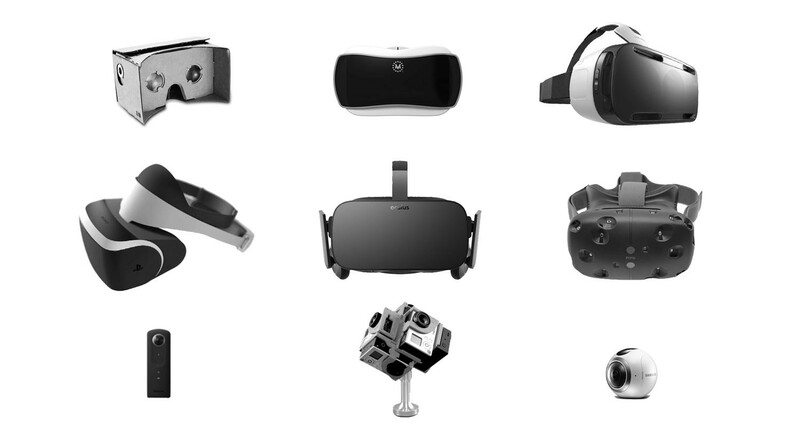 Just some of the available hardware you can buy to create and consume virtual reality. After decades of hype, disappointment and broken promises, virtual reality has finally become a reality. As my son says when he swears it’s true: for real life. Thanks to a former journalism student who left his Long Beach school to join USC and pursue the creation of head-mounted displays for VR, the new era of the next disruption has truly begun. And before you dismiss VR as something only for those techie kids, keep in mind that it’s a lot more than just for games or Hollywood movies. The key here — compared to failed technologies like Google Glass or, dare I say, the Segway — is that numerous players, large and small, are handling each aspect of the VR experience: creation, distribution and consumption. While the Oculus Rift, the device developed by that student, Palmer Luckey, brought this overhyped and forgotten industry back to life, his head-mounted display is now accompanied by HTC’s Vive, Microsoft’s HoloLens and Sony’s PlayStation VR. In addition to these high-end devices that range from $600 to $800, there are extremely affordable viewers like Google Cardboard and Mattel’s View-Master (yes, the toy introduced in the 1930s has been rebooted to handle virtual reality). But these devices aren’t the point, at least not yet. The key to VR, for journalism or anything else, is the device everyone — even your mother — already carries: the smartphone. Thanks to YouTube, Facebook, mobile apps and startups like Vrideo, among others, the most widely adopted device in human history is the gateway to the mass adoption of VR. In this mobile-first world, the phone can display these new immersive experiences effectively, even without a viewer. See for yourself: Launch your YouTube app on your phone and search for “360 meet largest dinosaurs BBC One” or “The Verge Michelle Obama 360” to see a couple examples of the growing number of diverse experiences. NOTE: I am not directly linking to those experiences because links don’t always launch the YouTube app. But you need to view the 360 video within the app to ensure the 360 experience. You can also view many of these experiences through your computer’s browser, especially through Facebook, which acquired Oculus in 2014. As they say, content is king, and that’s not only true but essential for virtual reality to be a mainstream success. But let’s be real: There’s a lot of gimmicky content right now. That means there’s an opportunity for true storytellers — ahem, us — to elevate this technology into a medium for engaging storytelling. Soon the wow factor from gimmicks will fade and this new form of immersive storytelling, if done right, will emerge as a powerful communications platform. No, these immersive experiences will not replace TV or movies. They won’t replace radio or theater. They won’t even replace print. There are predictions, though, that an immersive internet — the “metaverse,” according to Ernest Cline’s “Ready Player One” — will eventually become the way we function, decades from now. In the meantime, immersive content will be a unique platform that offers opportunities for the storyteller, the consumer and, well, the advertiser. Whether it’s sponsorship through underwriting or a logo at your feet or having to pay for these experience as we do apps or digital movie rentals, there are several possible revenue streams that facilitate more engaging and realistic branded experiences than random popup banner ads. What we’ve seen already is that immersive experiences can let you walk through refugee camps (“Clouds Over Sidra” or “The Displaced”), witness a rocket blast from within 20 feet (“Project Syria”), swim with dolphins (“The Dolphin Project”) and much more. All these experiences — despite their vastly different levels of quality and graphics — successfully trick your brain into believing you are there. Studies have found that they increase empathy and, in some cases, have even implanted memories. Needless to say, the new era of immersive experiences will bring in a new set of ethical questions that we will have to tackle as content creators and consumers. And while this concept of immersive storytelling may seem out of reach to you and your news org, it is not. Even in the tightest of newsroom budgets, getting your hands on a simple Ricoh Theta S for $350 (don’t get any of the lower models) or the Insta360 Nano for $200 unlocks this new medium. Take a look at a simple and effective 360 piece by Denver7 News (an ABC affiliate owned by E.W. Scripps Co.) that captured the recent flooding in Lumberton, North Carolina. While simple, it still has strong visuals and features a compelling character sharing an engaging story. Ultimately, it’s about the story. And a good story is a good story, regardless of the technology. But new technology like 360/VR can be incredibly effective, as these pieces show. One thing is for sure: VR is here and it’s for more than just gaming or movies. You have a smartphone to view it. You have YouTube and Facebook to distribute it. You just need a 360 camera to produce it.